HARK! I learned a new thing today and it felt great. I'm proud of myself to the max. At work I got slammed with a ridiculous task. I work at a consulting firm and one of our clients asked us to manage/update/revise/redesign their HR website, which presently is totally disorganized and out-of-date, not to mention extremely large. Sounds great. We employ a bevy of programmers and software engineers...this should be no problemo. BUT, the higher ups decide to assign none other than ME to be in charge of this project. Como se WHAT?!?!?! As a preface...I am so computer illiterate that it embarasses me as a member of my generation. Oh I email, facebook, tweet, whatever...but frankly when I sit down and try to wrap my brain around the internet as a whole I get a migraine. Its similar to how I feel about space. 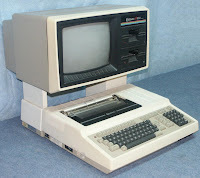 I wish we still used computers like this one sometimes. I don't even have a cell phone with the internet on it. I'm probably the least qualified person in the office to do this. I'm irritated, daunted, scared and nauseous (but that could've been due to the starburst I ate for lunch). I GOT IT! I'm no expert, but dammit I can make internet! I got a few little practice things done correctly and it was like AWESOME. This sort-of-mastery of my little job, which I expected to fail at, has been one of the most satisfying thing I've done in a while. Soon I'll be a full-fledged robot. Hot damn. Call me for web-editing. I'll be an extraordinairress in no time at all. I always say, set the expectations low and it'll be easy to exceed them. Congratulations on learning something new! And BTW, next time you need something for lunch, you can make a sandwich from the real food under my desk. Leave the Starbursts for dessert!